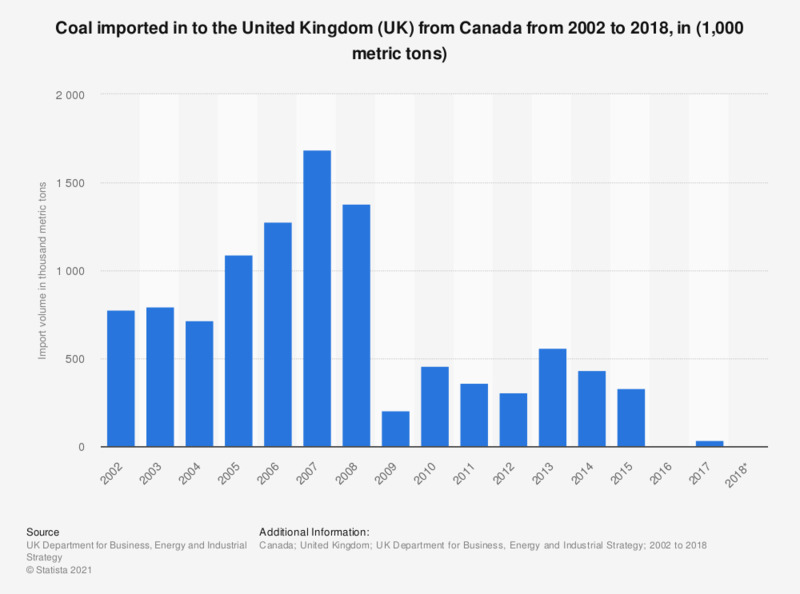 This statistic shows the total coal imports to the United Kingdom (UK) from Canada between 2002 and 2017. Coal imports from Canada increased notably from 2005 to 2007, when they peaked at approximately 1.7 million metric tons. In 2009, coal imports from Canada decreased dramatically to 203,000 metric tons and remained at a significantly lower level for the rest of the period, when compared to the years prior to 2009. Just 35,000 metric tons of coal was imported from Canada in 2017. *Figures for 2018 are provisional. Totals obtained by combining imports of steam coal, coking coal and anthracite.